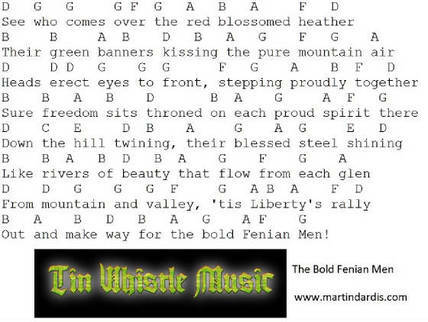 The Bold Fenian Men Tin Whistle Notes And Sheet Music. This was written by William Rooney in the year 1899. It's one of the most popular Irish ballads about the Fenians who organised the 1798 rising in Ireland. 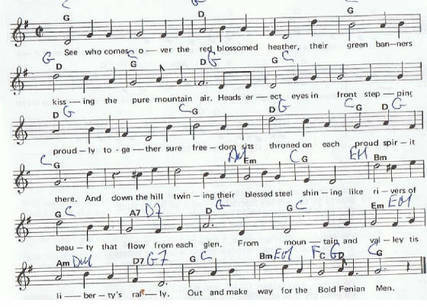 It has been recorded by most ballad groups in Ireland most notably The Dublin City Ramblers along with The Wolfe Tones. Another reason why it's so well known is that The Artane Boys Band have being playing the tune in Croke Park before big championship matches from the 1960's right up to the present day. The first set of notes are the one's I'm playing in the youtube video which differ only slightly to the sheet music version. Again I'm using a D tuned whistle. You may notice that I play the high D note differently than most players. This is basically for the video so you'll know I'm actually playing the high D as opposed to the low one. I leave the hole closest to the mouth ''Open'' where as others close all the holes while playing the high D, It's just a matter of choice really. To the inhabitants of the town and neighbourhoods of Tipperary. Every soul without discrimination found within will be put to the sword and the house destroyed. That should the Daringness of the disaffected lead them to outrage or cruelty on the properties or families of the peaceful and well disposed the whole neighbourhood will be laid waste.